To help your children use the internet safely, please read the official advice from the police on online safety for children. (CEOP) - see links below. 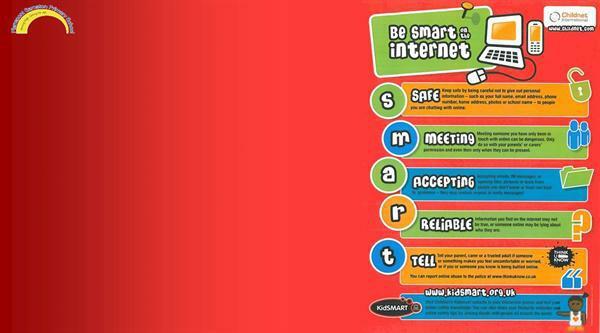 CEOP Website A police website containing advice for parents and children about internet safety. Also allows you to report any inappropriate online activity directed at children. Think U Know for Parents Linking closely with our e-safety policy, this site gives lots of information about how to stay safe online. Highly recommended! A guide for parents regarding social networking A practical guide for parents and carers whose children are using social media. Radicalisation and Extremism Advice How to protect your child from radicalisation and extremism. Parents Protect Part of a charity called the Lucy Faithful Foundation, this site gives lots of very useful advice - including a great jargon buster section. Ask About Games Lots of advice about issues and dangers associated with online gaming. Parent Zone Going way beyond just offering advice about online safety, there's lots of advice here for all sorts of issues affecting parents and carers of young people. Internet Matters Lots of advice about inappropriate content, cyberbullying, online grooming, sexting, online reputation, self-Harm, online images and radicalisation. Keeping your child safe on an iPad From techradar, a reputable technology site, this offers lots of advice about how to keep your child safe on an iPad. Keeping your child safe on an Android device From techradar, a reputable technology site, this offers lots of advice about how to keep your child safe on an android device. Safer Internet Centre Education packs giving advice on how to support children in using the internet safely. Own It A BBC website to help minimise the risk for children aged 9 to 12 in the digital world. Our Pact An app which helps parents to control their child's internet useage.